Fungal infections such as tinea capitis, tinea corporis, and tinea pedis, stem from a dermatophyte infection.1 Dermatophytes have been studied since 18412 and are a common cause of fungal infections.1 Clinicians typically treat these infections with topical antifungal creams, lotions, ointments, and powders. When using topical antifungal drugs, patients must be aware of common adverse effects (AEs), such as application site irritation and hypersensitivity reactions. These AEs are rarely systemic. When patients fail to respond to topical therapy or have extensive skin involvement, they may need an oral antifungal agent. Systemic antifungals, however, increase the need to consider drug interactions. Concentrations of the calcineurin inhibitors, cyclosporine, and tacrolimus, also increase when administered with posaconazole or voriconazole. Prescribers should reduce the original tacrolimus dose by one-third and monitor blood levels frequently when administering it concomitantly with either azole.6,7 The cyclosporine dose must be reduced by 25% with posaconazole and 50% with voriconazole. Finally, azoles can prolong the QTc interval, elevating the risk for torsade de pointes.10 Although this adverse event is important in its own right, it is more likely when azoles are taken concomitantly with a number of other medications. The azoles/fluoroquinolone combination is particularly interesting. Commonly prescribed in patients with hematology as prophylaxis, these drugs address bacterial and fungal infections.11 Both drugs can prolong the QTc interval and increase the risk of torsades de pointes synergistically if given together.11 Clinicians with patients on this combination should monitor each patient’s QTc interval closely. This summary mentions only a few interactions. Because of the wide range of effects the azoles have on the human body, many more interactions are possible. 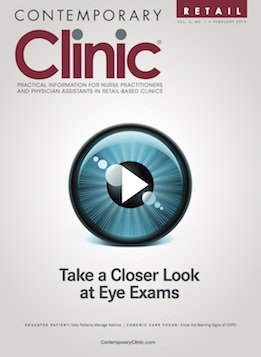 Clinicians must check for possible drug interactions when patients take oral antifungals. Seebacher C, Bouchara JP, Mignon B. Updates on the epidemiology of dermatophyte infections. Mycopathologia. 2008;166(5-6):335-52. doi: 10.1007/s11046-008-9100-9. Gräser Y, Monod M, Bouchara JP, et al. New insights in dermatophyte research. Med Mycol. 2018;56(suppl 1):S2-S9. doi: 10.1093/mmy/myx141. Hylton Gravatt LA, Flurie RW, Lajthia E, Dixon DL. Clinical guidance for managing statin and antimicrobial drug-drug interactions. Curr Atheroscler Rep. 2017;19(11):46. doi: 10.1007/s11883-017-0682-x. Brüggemann RJ, Alffenaar JW, Blijlevens NM, et al. 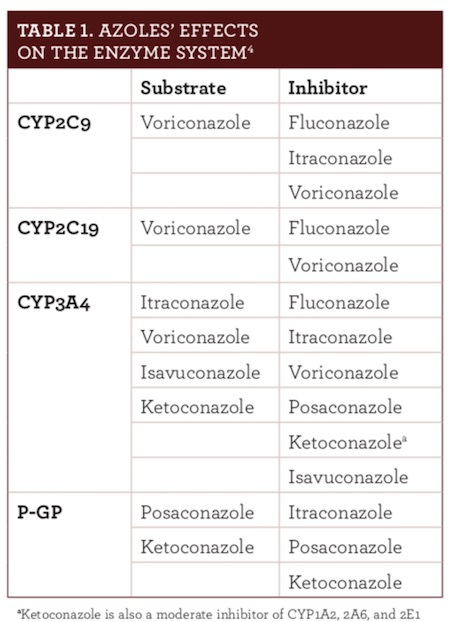 Clinical relevance of the pharmacokinetic interactions of azole antifungal drugs with other coadministered agents. Clin Infectious Dis. 2009;48(10):1441-1458. doi: 10.1086/598327. Vrablik M, Zlatohlavek L, Stulc T, et al. Statin-associated myopathy: from genetic predisposition to clinical management. Physiol Res. 2014;63(suppl 3):S327-S334. Voriconazole [prescribing information]. New York, NY: Pfizer, Inc; 2010. www.accessdata.fda.gov/drugsatfda_docs/label/2010/021266s032lbl.pdf. Accessed July 2, 2018. Posaconazole [prescribing information]. Whitehouse station, NJ: Merck & Co, Inc; 2015. www. accessdata.fda.gov/drugsatfda_docs/label/2015/022003s018s020,0205053s002s004,0205596s001s003lbl.pdf. Accessed July 2, 2018. Surowiec D, DePestel DD, Carver PL. 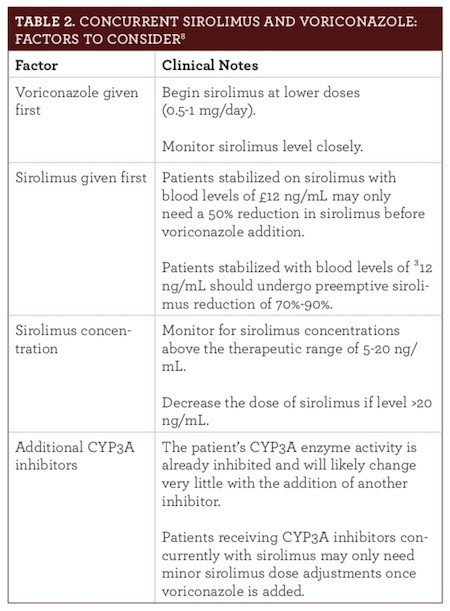 Concurrent administration of sirolimus and voriconazole: a pilot study assessing safety and approaches to appropriate management. Pharmacotherapy. 2008;28(6):719-729. doi: 10.1592/phco.28.6.719. Fluconazole [prescribing information]. New York, NY: Pfizer, Inc; 2011. www.accessdata.fda.gov/drugsatfda_docs/label/2011/019949s051lbl.pdf. Accessed July 2, 2018. Salem M, Reichlin T, Fasel D, Leuppi-Taegtmeyer A. Torsade de pointes and systemic azole antifungal agents: analysis of global spontaneous safety reports. Global Cardiol Sci Pract. 2017(2):11. doi: 10.21542/gcsp.2017. Zeuli JD, Wilson JW, Estes LL. Effect of combined fluoroquinolone and azole use on QT prolongation in hematology patients. Antimicrob Agents Chemother. 2013;57(3):1121-1127. doi: 10.1128/AAC.00958-12. Harris KA, Weinberg V, Bok RA, Kakefuda M, Small EJ. Low dose ketoconazole with replacement doses of hydrocortisone in patients with progressive androgen independent prostate cancer. J Urol. 2002;168(2):542-545. Castinetti F, Guignat L, Giraud P, et al. Ketoconazole in Cushing's disease: is it worth a try? J Clin Endocrinol Metab. 2014;99(5):1623-1630. doi: 10.1210/jc.2013-3628.